White Collar Crime in Georgia--A Blog By The Goolsby Law Firm, LLC. (706) 863-5281: Bernie Madoff and The "Corporate Perp Walk"
By now, we have all seen photographs in the news of Bernard "Bernie" Madoff, the convicted swindler and ponzi scheme perpetrator who ripped off billions of dollars from investors and is now serving a 150 year prison sentence. In my opinion, his crimes are deplorable and he is despicable. 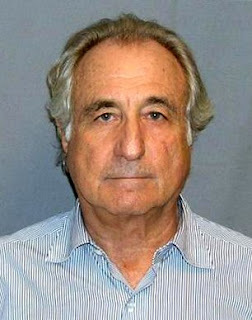 But what did you think about the staged photographs taken of Madoff, shortly after his arrest, while he was in handcuffs? Was this practice proper? In the criminal justice lexicon, this staged practice involving government agents parading an arrested white collar criminal (or perpetrator) before news media photographers is known as the "corporate perp walk." The apparent goals include fostering a public image of guilt for a prominent public figure and perhaps whetting the public's appetite for a guilty verdict. As a former federal prosecutor, even as to those, like Madoff, accused of heinous crimes, I did not believe in allowing government agents to conduct a "perp walk." I believe that, if they are guilty, then you should prove it inside the courtroom, not outside the courthouse. I once recall a situation in which agents, intent on getting their news headlines and "perp walks," raided a small town bank in south Georgia, while armed and wearing raid jackets. The agents must have resembled storm troopers. The incident terrified innocent bank customers and bystanders, along with the arrested bank officials. It was a disaster! And it was unethical and perhaps unconstitutional, in my opinion, to stage such a "perp walk." As to Madoff, while we all are disgusted with his crimes, and while we may believe 150 years may be too lenient, we still can believe the government should go about its job in a professional manner. And, in my opinion, that means dispensing with the "perp walks."